How do I set-up direct deposit for reimbursements? | Benefit Resource, Inc.
How do I set-up direct deposit for reimbursements? 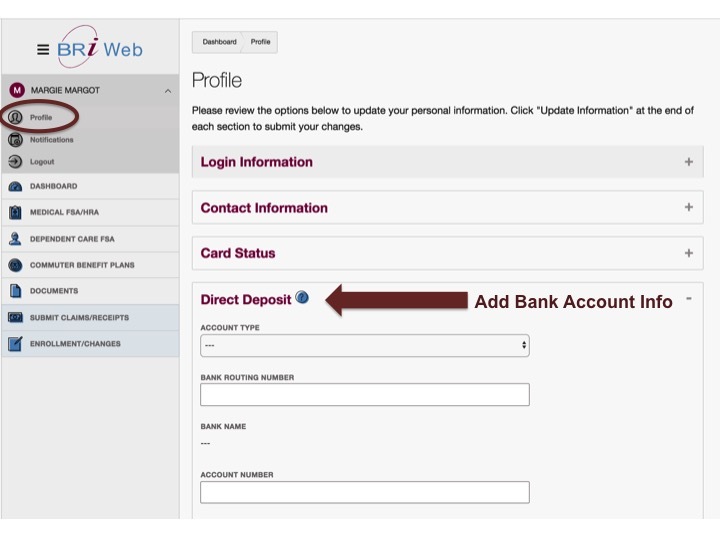 You can set-up direct deposit by logging into your account on BRiWeb. Navigate to the Profile section. Enter the bank account and routing number in the Direct Deposit section. It may take up to 10 days for your direct deposit account to be account. Please note, any pending reimbursements may be paid by check. Watch your account and mail to confirm! What information will I need in order to sign up for direct deposit? How long will it take for my reimbursements to be deposited directly into my account? How do I change my direct deposit account once it is set-up? When will a claim reimbursement be available in my bank account?